As I enter my 38th year as a business owner, I’ve learned this: One person can make a difference; and when you get more people involved, it becomes like a snowball that’s rolling down hill. It’s just gets bigger and bigger. I’ve applied this principle to my business, a professional courier service that is a 24-hour, 7-day-per week operation. I started the business, but today have a great team of people who help operate it on a day-to-day basis. I also apply this principle to my volunteer work, where I get a great deal of satisfaction knowing that in some small way I helped make a difference while leaning on the people around me to make it happen. Here’s a case in point that’s very close to my heart. On November 6, 2011, Rebecca Steffes, Senior Property Manager for Piedmont Office Realty Trust, and I put together a team of 11 people to help raise funds to support the Rehabilitation Institute of Chicago (RIC) through the second Sky Rise Chicago stair climb held in the Willis Tower, a BOMA/Chicago building member. I have the privilege of serving on the RIC committee that set a goal of raising $1 million for the climb, which is pretty unique because it allows participants to compete by foot power and even by use of a hand cycle for those unable to walk. Rebecca and I put together a team that included many other members of the Chicago commercial real estate community, as well as Arrow Messenger Service employees. Our team raised more than $15,000 in pledges for RIC, an independent facility that helps severely injured people get their lives back. Anyone who was at the climb probably felt like me; you didn’t know whether to cry more or smile more. I looked out on thousands of people – famous, not-so-famous, heavy, skinny, young and old – all making their way up to the top of one of the tallest buildings in the world. 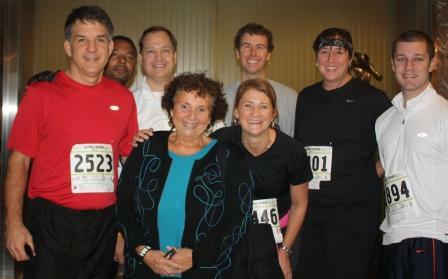 Members of Team Tower Stormers, with Phyllis Apelbaum (center, foreground) and Rebecca Steffes, following the November 6 SkyRise Chicago fundraiser. One young man did it differently. He is a double amputee who chose not to use his prostheses. Instead, he took off his legs and climbed all 103 flights on his knuckles, swinging his body behind him. It was incredible to watch. While waiting at the top for our team, along came another great RIC supporter, Mark Stephan, who was a patient at RICfollowing a spinal cord injury that left most of his body paralyzed. He took it one step at a time and completed all 103 flights beating his time from the 2010 climb! When I’m around him, I always feel that if he could do that, there’s no reason people can’t accomplish anything in life if they set their mind to it. Looking back at my own career, I find it an honor to have the opportunity to speak at places like DePaul University and Roosevelt University on the subject of entrepreneurship. It takes me back to my roots, to what it was like to start a business. Being in business for yourself is not for everyone; but opportunities surfaced and I took advantage to build a successful business. If you have thoughts on your personal volunteer activities and how they’ve shaped your career, please feel free to share them. This entry was posted in Chicago CRE industry and philanthropy and tagged Arrow Messenger Service, BOMA/Chicago, DePaul University, Hillary Clinton says it takes a village, Piedmont Office Realty Trust, Rehabilitation Institute of Chicago, RIC, Roosevelt University, Sky Rise Chicago stair climb, Willis Tower. Bookmark the permalink.